* ELECTRONICALLY SCANS ROOM for hidden wireless microphones and transmitting cameras. Ultimate anti-spy tool lets you quickly locate hidden devices while telling you what kind of spy technology they are. Super fast processor gives you rapid results covering a much wider range of modern bugs. Lets you outsmart thieves, spies, pranking friends, suspicious spouse, nosy boss and many more. * DETECTS RF SIGNALS with a built-in Frequency Meter. This is the tell tale sign of a listening or camera device set to eavesdrop on your activities. Quickly locates these devices revealing their frequency band. Now you can enjoy worry-free privacy without the threat of detection. * INSTANTLY RECOGNIZES MOST FREQUENCY BANDS used by nearly all spy devices. Detects GPRS, EDGE, 3G/4G, DECT, DECT BASE, BLUETOOTH, WLAN, GPS, Wi-Fi. As soon as the device sends a signal to the spy, the BugHunter BH-03 spots it. Great for scanning your hotel room, office, home, meeting room and vehicle. Lets you filter out unnessary (known) positive signals. Don't leave home without it! * DETECTS WIDER RANGE OF BUGS at 70dB sensitivity including those with very weak signals and those with especially high power. This gives you access to a much wider range of bugs than most other anti-spy devices. Detection range is up to 16 feet in all directions. When set to Security Mode, it warns you if a spy device appears anywhere within 164 feet. Light weight of 3.9 oz and compact dimensions 4.1 x 2.3 x 0.7 in. * 100% MONEY BACK GUARANTEE ensures this will quickly become your favorite no-risk purchase. Many people are getting several of these to have one at home, another in the car, and a third at work. HURRY AND BUY NOW while we have this very popular improved model in plentiful supply. This makes a fine birthday gift, holiday present or anniversary gift for anyone who values their privacy! 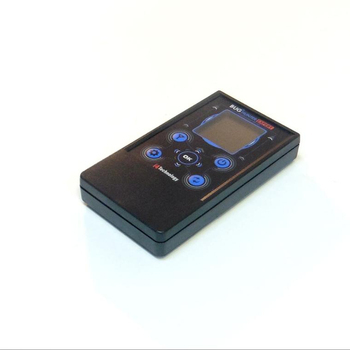 LATEST TECHNOLOGY - ANTI-SPY BugHunter BH-03 Expert RF Signal Detector with Frequency Meter. This detects most kinds of RF signals used by hidden microphones and spy cameras to transmit clandestine information about YOU. Use this smart tool to quickly find hidden microphones and cameras that can be recording and transmitting your conversations and activities. You may be surprised how often this happens. Many people use this to scan hotel rooms, meeting rooms, vehicles, government offices, public buildings, schools and much more. Detecting bugs before they can invade your privacy can be a very effective step in protecting from identity theft, financial theft, blackmail, jealous spouses and overbearing prosecution. ADVANCED FULL FEATURES including a frequency meter that lets you instantly locate and identify the type of spy device. Uses a beeping sound to tell you when you're getting closer. Lets you easily exclude unnecessary (known) positives like your computer or phone. Allows you to check under beds, in corners, in closets, behind light fixtures, behind pictures and much more. Detects both digital and analog bugs simultaneously. The fast microprocessor successfully finds modern bugs that transmit in short pulses to evade most other detectors. This unit has you covered like no other! LIGHTWEIGHT AND COMPACT easy to carry everywhere with you in a coat pocket, purse, backpack, auto glove compartment, computer bag and brief case. Weights just 110 gr. (3.9 oz) and measures a mere 105 x 58 x 18,5 mm (4.1 x 2.3 x 0.7 in.) Essential for business travel and vacationing in foreign countries. It operates from rechargeable or conventional alkaline batteries giving you excellent flexibility on the road. EXCELLENT GIFT idea for friends, family and co-workers. Everyone loves receiving this for Christmas. Hurry and get yours while we have a new shipment in stock. This upgraded model offers a terrific value not found in other anti-spy devices sold elsewhere. Get this to outsmart today's advanced techno spies! 1. 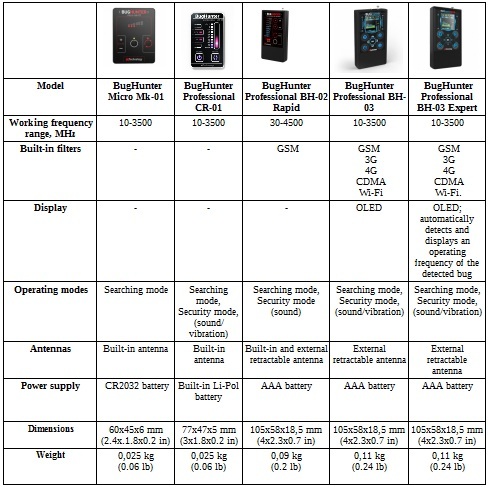 Why choose BH-03 Expert over other similar Spy bug detectors and RF meters. Real-time signal indication on the screen means faster search and more precise results. Simultaneous display of digital and analog sources of signal. Option to apply filters for cutting off signals you want to ignore. 2. Is it possible to detect hidden cameras with a Spy bug detector? Yes, if it’s wireless and transmitting signal over network or radio signal. 3. My BH-03 does not charge, what’s the problem? In menu you can choose operation from rechargeable or conventional batteries. If conventional type is chosen, rechargeable batteries would not charge.